Micron21 Review 2019: Is Micron21 a Good Hosting? Micron21 is an Australian IT company with a wide range of services for both private users and small business clients. They use data centers in Australia and U.S. in order to provide a stable and secure service to users worldwide. Micron21 offers a comprehensive range of premium service and industry-leading technology solutions for small and medium businesses with custom packages, domains, and web-hosting with specialist engineers. Providing a wide range of services for demanding customers to enjoy the maximum reliability and faster load times with the latest generation server hardware and technological infrastructure located in their data centers in Sydney, Melbourne, and Los Angeles. Probably the one aspect Micron21 is most proud of is their Tier IV data center. This has been independently certified by Uptime Institute as the single most secure, reliable, and high-powered commercial data center in Australia – and it is this ISO 27001-certified data center that houses the very servers your website will be hosted on. They also have an e-commerce cloud hosting package available, which gives you the same amount of space and bandwidth, but includes an additional 1GB RAM and upgrades you to 200% CPU core allocation. If either of these options feel like too much or too little for you, you can also customize your own cloud hosting package. Simply click on the Order Now button on their cPanel Web Hosting page and you’ll be taken through a process that allows you to configure almost every aspect of your cloud hosting plan. Micron21’s cPanel shared cloud hosting packages utilize CloudLinux and LiteSpeed Web Server, both of which work seamlessly to ensure optimal processing and loading speeds for your server. They have a “no overselling” policy for their shared servers, which maintains a healthy buffer so that no website will be adversely affected by another’s traffic spike. You get regular offsite data backups and restorations, along with a simple application installer that includes WordPress, Joomla!, Magento, and many more. At any time, should you wish to move your website to a more dedicated cloud environment, Micron21 has already charted out a straightforward and easily accessible migration pathway. As to pricing, everything is customizable. On the platform, you can easily choose and adapt your own set of available options that will suit your needs and get the price that is in the average range for that kind of service. The support team operates on a highly professional level with the response time of an average of 10 minutes. Whatever problem you may encounter they offer immediate solutions. Furthermore, there are two phone support options for Australian and international clients, and both are active 24/7. Micron21is an Australian company that offers scalable and customizable-designed services to meet your business needs. In addition to the rock-solid technological foundation of their premium data center and network, the company guarantees reliability and consistency in the design and provision of ongoing services. 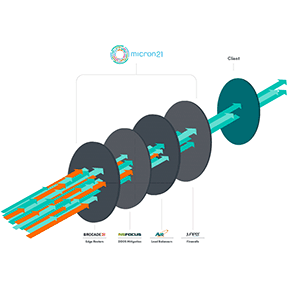 Wondering how Micron21 stacks up against other Web Hosting companies? Enter any other Web Hosting company and we will give you a side-by-side comparison.